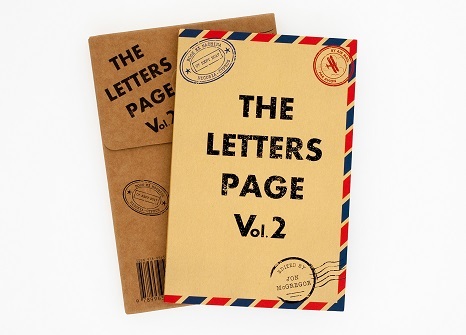 The Letters Page, Vol 2: a limited edition 78 page booklet in a handsome custom-designed mailing package. Volume 2, produced in partnership with Book Ex Machina, comes packaged in a limited edition embossed envelope, continuing a celebration of the printed object which started with Vol 1’s boxed set of letters. Taking influence and plagiarism as a loose theme, Vol 2 includes letters from: Andrew McMillan, on being a poetic offspring; Chimene Suleyman, on the unoriginality of Cyprus’s no-man’s land; Nicole Flattery, on literal theft as metaphorical homage; and Joe Dunthorne writing in a univocal form he stole from Georges Perec. Volume will be launched in October 2017, but you can obtain a copy by ordering directly from Book Ex Machina. If you would like to attend the Volume 2 launch at Five Leaves Bookshop please visit their website to RSVP. Errata: Owing to an unfortunate lapse in concentration, there are two errors in this otherwise flawless volume of The Letters Page. Matthew Welton’s letter was originally published by If A Leaf Falls Press with the title Five Pieces, each of 250 words, and should have retained that title here. Also, by adding our contributor’s note to his footnotes, we made his footnotes exceed 250 words. Our sincere apologies to the author. In Darren Chetty’s letter, on page 45, the name of Rakim was inexplicably changed to Karim. Our apologies to the author, and to Rakim himself.